Hardcover, 5 5/8 in. x 8 3/4 in. 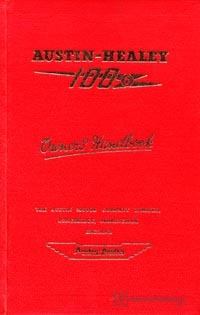 This Austin-Healey 100/6 Owner's Handbook contains technical data, maintenance procedures, service information and operating instructions. It details service procedures such as changing engine oil, carbureter tuning, adjusting valves and bleeding brakes and clutch. This Austin-Healey operator's manual contains routine maintenance and routine service, as indicated in the table of contents but should not be confused with the full workshop manual. It is designed for chauffeur, owner, or light duty garage.